Scary #1: social events in my office lobby are so loud none of us can do work. Scary #2: they serve the worst wine ever. Scary #3: I usually still drink it. Scary #4: I’m not on the verge of vomiting from this $8 bottle for once. It’s a Cab from the Colchagua region of Chile. It’s no Screaming Eagle, but I’ve had MUCH worse. 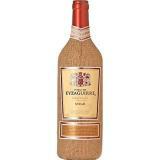 Still, it’s a bottle wrapped in a burlap sack which is about as cheesy as a plastic basket encasing a bottle of Chianti. Proven: Work drives me to drink. And lower my drinking standards. Tags: colchagua chile cabernet sauvignon wine. Bookmark the permalink. Previous post ← for those about to drink, ac/dc salutes you!! !